On May 22, three new F-35 aircraft landed at Ørland Air Base in Norway. Six aircraft are now on Norwegian soil. – Our new F-35s are a major investment and the most important acquisition to strengthen the defence capabilities of our Armed Forces, said Defence Minister Frank Bakke-Jensen. According to the plan, Norway will receive six new F-35s every year until 2024. “Delivered on time, the three new aircraft represent a new milestone in our acquisition program. We are now another step closer to reaching Full Operation Capability with the F-35 in 2025. Until then, we have a lot of infrastructure to build on the two air bases Ørland and Evenes; New equipment and systems need to be fitted, and dedicated personnel are being educated and trained on the new combat aircraft system to be able to ensure Norway’s safety and sovereignty in the future. The F-35 will significantly strengthen our Armed Forces’ joint defence capability,” said the Defence Minister. According to the plan, Norway will receive six new F-35s every year until 2024. Today’s arrival follows the delivery of the three first aircraft in November 2017. Since then, the Norwegian Air Force has been carrying out operational testing and evaluation of the F-35 in Norwegian conditions, aiming for Initial Operational Capability (IOC) in 2019. “With the F-35, we are introducing a completely new concept, requiring our entire Armed Forces to adapt and innovate. I am confident of the efforts our dedicated personnel are putting in to reach Initial Operational Capability in 2019, and that we will reach this important milestone by the end of 2019,” said the Defence Minister. Based on the Storting’s (Norwegian Parliament) ambitions, Norway plans to acquire up to 52 F-35 combat aircraft for national defence purposes. The number is verified by analyses carried out by the Norwegian Defence Research Establishment and the Ministry of Defence, and confirmed by the latest threat assessments and the Armed Forces’ Long-term Plan. “We will conclude our acquisition and reach Full Operational Capability by 2025. The F-35 can identify, locate, strike heavily defended targets, and it offers high survivability faced with modern threats. The aircraft is difficult to detect on radar and can operate in high-threat areas where today’s F-16 cannot. The F-35 has sensors with great reach and high resolution, which offers good situational awareness for both our own and allied forces. An advanced weapons system, the F-35 offers a major capability that will strengthen our ability to react quickly to threats over great distances,” said Major General Morten Klever, Director for the F-35 acquisition program at the Ministry of Defence. An advanced weapons system, the F-35 offers a major capability that will strengthen our ability to react quickly to threats over great distances, said Major General Morten Klever, Director for the F-35 acquisition program at the Ministry of Defence. The F-35 acquisition is within the cost framework approved by the Storting. “We conduct thorough cost analyses annually, and work continuously to ensure that we keep costs down. This is a major investment in terms of money, but it is an even greater investment in Norwegian security,” said the Defence Minister. 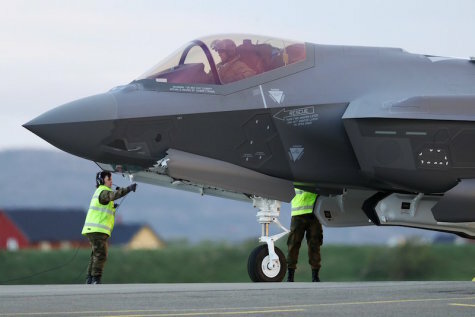 In addition to the six aircraft now at Oerland Air Base, the Norwegian Air Force has seven F-35s stationed at Luke Air Force Base in Arizona, USA. These are being used for training and education.